The Sears brand has a long and stories history in American culture. The Sears line of appliances has an equal amount of history behind it as well. Sears’ line of home appliances ranges from refrigerators to washers and dryers. Sears has made a name for its products by continuing a legacy of dependability. Even such a robust brand name appliance can break. So when your Sears appliance is in need of repair, Action Appliance Repair is here to help. Since 1961, our family-owned and operated business has made customers our priority. A broken appliance can have a major impact on how your home operates on a daily basis. Our customers have returned to Action Appliance Repair year after year for all their repair needs. Why? Our expert technicians have over 50 years of experience working on quality appliances such as Sears. 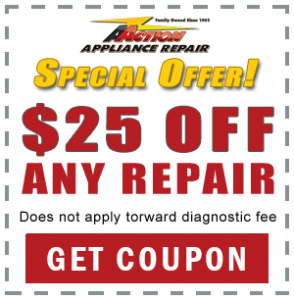 Instead of searching for a reliable service center or technician, contact Action Appliance Repair. If your Sears appliance breaks or needs maintenance of any kind please call our center toll free at 866-611-4479. Action Appliance Repair is so committed to providing you with quality service that your actual service call is absolutely free with each repair we make. When your Sears appliance needs repair of any kind then make sure to call us today for quality work. We specialize in working with Sears appliances and our expert technicians give you peace of mind that you appliance will be repaired and running like new again. We also proudly offer our customers a 5 year pro-rated parts warranty. So what does calling Action Appliance Repair for your Sears appliance mean for you? We waive the fee of our service call if we repair your Sears appliance. You won’t owe us anything if we visit and are able to repair your appliance. Expedient services from trained and reliable technicians. We proudly provide you with mannerly technicians who respect your time and privacy. We are happy to provide you with a courtesy call within 30 minutes of our visit. This gives you peace of mind that we aren’t wasting our time and you won’t have to hang around the phone. Our quote is what you pay. No hidden fees, random charges, or annoying after costs. The number we give you is the number you pay, guaranteed. Fill in your name and email and an Appliance Repair Expert will contact you immediately for a Free No-Hassle Quote!